Found throughout much of the United States, cedar waxwings commonly feed among summer berries in forests or on farmland fruit. They have blue-gray wings and bodies and reddish-brown heads topped off with masks and crests jutting rakishly toward the backs of their heads. Males and females are nearly identical; only a few slight differences give clues to gender. 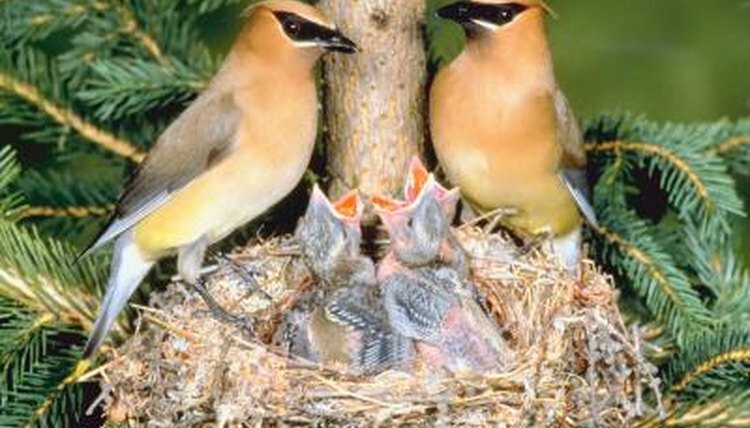 Cedar waxwings nest during summer and early autumn, sometimes raising two sets of nestlings during a season. The female selects the nest site and will perform much of the construction of the original nest. After the first set of young leave the nest, the male will usually help make repairs in preparation for a second clutch. Coloration lends almost no help to determining waxwing gender -- but the male's chin has black throat feathers; they are darker than the brownish-black throat feathers on the female. Another visual cue exists: The adult male's tail is broader than the adult female's.